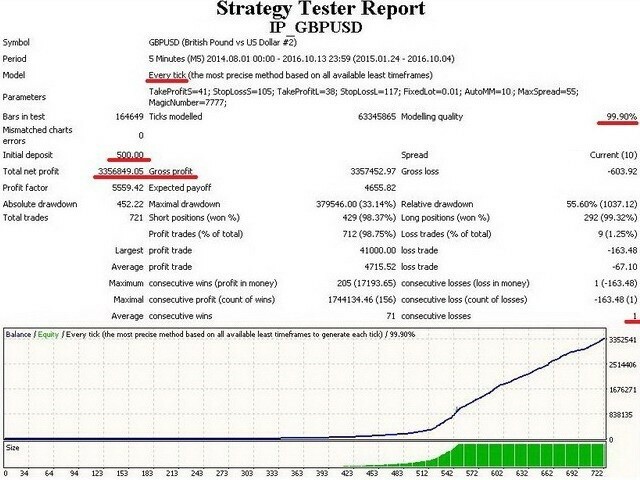 Expert Advisor for trading the GBP/USD on the M5 timeframe. It is based on the strategy of "waiting out", the market entry (and exit) points are determined on the basis of correlation of a number of indicators. The trading volume for opening a position depends on results of previous trades. It is possible to limit the amount of risk (AutoMM parameter). It is also possible to set the maximum spread, above which the EA will automatically pause trading (MaxSpread parameter). StoplossL - stop loss for sell orders. AutoMM - limit on the amount of risk (in percents). MaxSpread - maximum spread, trading will be paused when exceeded. MagicNumber - any unique number to identify this EA. Stay away from this EA makes only small profits and huge losses .... not advised. Or idea use it with reverse operations. You have been warned. I'm with mayamak 100%. Great EA but if you like to be careful with your trading, I have found the best settings are AutoMM = 2 and Max spread = 25 (points). Defaults setting are good for aggressive traders. Even so, drawdown still not to bad. Also, use low spread broker i.e. ICMarkets, Activtrades or Tickmill. EA trades good has little draw down but always closing in profit. EA's doing ok for now - have some drawdowns running. Will update as we go - interested to see how this will work out in the longterm - if things work well the stars will go up. For now, make sure you read the description and comments pages very carefully - I initially misunderstood how the stops function worked on this EA. Author has now clarified. I dont know how, I don't know why but it's the best EA that I ever bought. Worth every money! One month on real accounts - ICMarkets (ECN), LMAX (MTF) and AdmiralMarkets (NDD). On all of them this EA is VERY PROFITABLE! Added extended support for 5-digit brokers to enter/exit the market more accurately. Added the ability to pause trading on Fridays for a more flexible and stable trading. Added ability to respond to market news reducing risks (add "http://ec.forexprostools.com" to WebRequest). Added the "smart-hedging" algorithm, which allows trading BUY and SELL orders simultaneously, and which increases the profitability and stability. Increased profitability (30% up), added new efficient trailing algorithm, which automatically modifies takeprofit and stoploss and thereby can increase profit and minimizing losses.